The Coves ponds are a sub-watershed of the Thames River and contain three distinct ponds which are connected to the rest of watershed by a ravine system to the south of the east and west ponds. The ravines provide migration routes and drainage channels into the ponds below. What was once part of the Thames River is now a set of oxbow ponds which promotes species diversity. The City of London, Ontario has designated the area as an Environmentally Significant Area (ESA) which will protect the lands and allow it to be renaturalized. During the first week of December the weather was absolutely beautiful. The temperatures were around 10 degrees celsius which is abnormally warm for this time of year. Of course I took full advantage of this and spent the entire weekend outdoors taking photographs. I decided to spend my Saturday and Sunday in The Coves ESA which has had the trail system completely redesigned. On Saturday, I parked my car along Springbank Drive, grabbed my backpack, got out my camera and headed down the trail into The Coves. 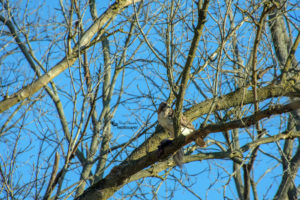 As I reached the boardwalk I saw a Red-Tailed Hawk land in the trees with what appeared to be a freshly caught squirrel. So I left the trail and walked out into the field to get underneath where the hawk was perched with its meal. When I got to where I could clearly see the hawk I began taking photos as it began to remove the squirrels fur to get at the meat. After I left the hawk to enjoy its food I headed back onto the trail. I spent the rest of the afternoon enjoying the beautiful day before heading back home. On Sunday, I parked my car in the same spot I did the day before, hiked past the pond and crossed over Cove Road to a more forested area of The Coves. Immediately after entering the forest I could hear the sounds of woodpeckers in the trees all around me. 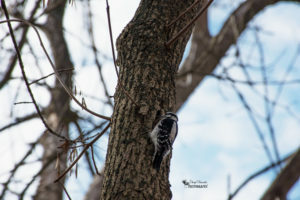 I adjusted my camera settings and was able to capture a couple of Downy Woodpeckers as they searched for insects under the tree bark. 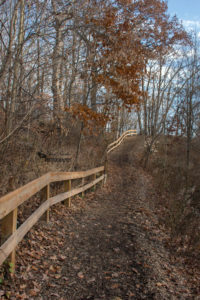 After continuing down the trail a little farther I climbed a small hill and heard the call of a Cardinal over my head. 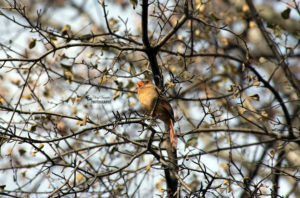 I searched the trees for the bright red feathers of the male Cardinal but instead saw a female which I was able to photograph before it took off. For the rest of the day I sat next to the pond and took in the gorgeous scenery all around me. 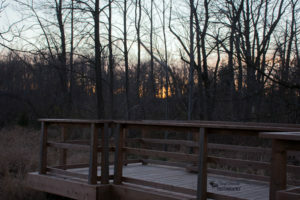 As the sun starting going down I could hear a bird call which I did not recognize. Then all of sudden a dark blue bird landed on a tree in front of me. I took a photo of it before it crossed over to the opposite side of the pond. 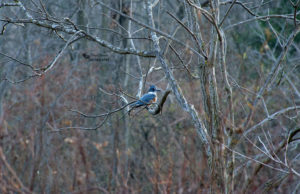 It wasn’t until I got a better look at the picture that I discovered it was a Belted Kingfisher. 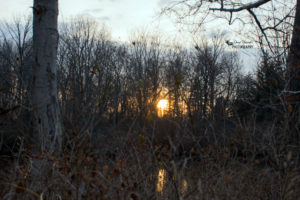 As I made my way back to my car I captured the last bit of light peaking through the trees before the sun disappeared. Below are the photos I took during my weekend in The Coves ESA. 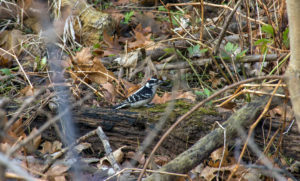 This entry was posted in Hiking Trails, Nature Photography, Wildlife Photography and tagged belted kingfisher, birds, birds of prey, Camera, cardinal, hike, hiking, london, nature, nature photography, Nikon, Nikon D7200, ontario, outdoors, outside, Photo, Photography, red tailed hawk, The Coves, trail, trails, wildlife, wildlife photography, woodpecker. Springwater Conservation Area – Insects Galore ! !